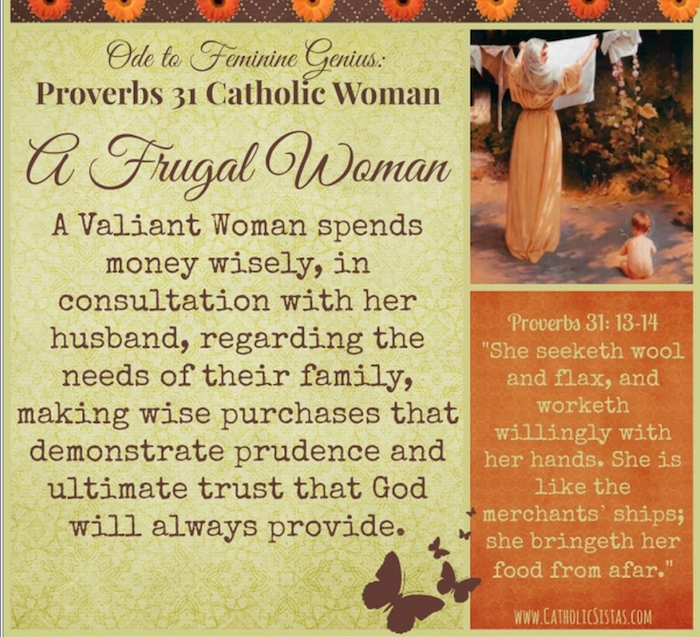 A Frugal woman. Sounds kinda boring, doesn’t it? Like that woman wearing an ill-fitting jeans jumper that looks like it’s from 30 years ago, buying only day-old bread, never getting anything nice or new, and spouting off about how everyone should grow and grind their own flour, like her. Um yeah, I really don’t want to be that lady. The good news is that being frugal doesn’t have to look like that at all. Frugality just means making wise use of the gifts God has given us, whether it’s our talents and skills, our monetary income, our time and effort, or the material items we own. It means not wasting or throwing away those gifts. How does that look in everyday life? I’ll tell you about one major way my husband and I try to be frugal, then I’ll go through several different points to think about in considering how best to become more frugal in your own life. Money can be a difficult topic in any marriage. I’ve heard that financial difficulties or disagreements are responsible for a large percentage of divorces, and any married couple can tell you it’s the source of many arguments. As much as we should perhaps want to “rise above” such mundane and materialistic concerns, it can be difficult to avoid hearing your spouse criticize your spending habits and not take it personally. My husband and I have had our share of disagreements, usually rising from a difference in how our parents handled money and how we were raised to think of money, or even just our personalities – a matter of us doing things differently from each other, rather than one of us doing anything wrong. We’ve managed to work out a system that has been working fairly well for us with ideas originating from a variety of sources. For a few years now we have roughly followed the advice of Dave Ramsey. The biggest change for us was going to a cash budget and planning where all of our money is going to go each month before we spend any of it. I’m better at making plans and organizing the details, so I work out the budget in a spreadsheet I created and figure out what bills we’ll need to pay and how much money goes in which envelope for the month. My husband is better at making sure those planned details actually happen, so he’s the one who sits down and writes the checks for the bills and makes sure each one gets paid. It amazed me at first, just how easy it was to stay on budget, simply because I had to actually pull out cash for whatever I wanted to buy! From one month to the next, we went from spending more than my husband’s paycheck, to being able to save money each month! I was afraid we’d feel so deprived, or that it would actually start more arguments, since we were really making an effort to save up some money in a “rainy day fund”, but that wasn’t the case at all. We try to touch base about the budget monthly or when there is a major expense that comes up and I think that heads off any arguments because we deal with differences or problems before they get big and emotional. Of course, we have had to make many adjustments as our family changed, our needs and wants changed, and my husband’s job changed. And it’s taken time to figure out the best separation of roles and what we each are best at. Nowadays, the changes are more minor since we’ve gotten the bigger aspects of our system worked out. In fact, the biggest change I have planned is to sew a cash envelope wallet (like in the tutorial here), to replace our ratty and wrinkled paper envelopes that tend to get misplaced or ripped. Frugality is a difficult thing. Budgeting and money management is part of it, but clearly not the whole. The monthly duties of planning the budgeting and paying bills can easily be compared to the myriad daily choices we make that comprise a frugal way of life. It means a daily commitment to using the gifts we’ve been given wisely, deciding as a couple (for married folks) how best to use what we have, and to trusting that God will provide what we need as long as we do our part and follow His will. That looks different for each family, and it certainly is a balancing act trying to figure out what works best. plan your budget: do what works for you. A spreadsheet plan and cash in envelopes has worked great for us, but another system might work better for your family. change it when needed: especially at first, towards the end of the month I would take money from envelopes that still had any to fill needs in other categories. When I frequently find myself short in one envelope and with extra in another, I change the budget for the next month. Meal planning helps avoid wasted food, planning several errands for the same trip save time and gas, planning ahead for clothing needs enables you to take advantage of the best sales. Even in small things, planning can help: knowing you have enough milk or eggs for tomorrow’s breakfast means avoiding a last minute shopping trip or a stressful change of menu in the morning. look at each of your strengths and weaknesses to decide how best to divide the responsibilities, whether it’s budgeting and bill-paying, shopping and cooking, childcare, or anything. if things change, discuss with your spouse again. Consider whether clipping coupons is for you. Have you checked out discount or second-hand stores in your area? Even if there are some things you really want to buy brand new, I’m frequently amazed at the quality of some items I find at my favorite thrift stores! Even having “grungy” clothes set aside for when you paint or do other messy stuff (or having separate play and school/church clothes for your kids) is also a way to be frugal, because it saves your nicer (and usually more expensive!) clothes from getting stained, torn, or otherwise ruined. share skills with others: my MOMS club enjoys doing some play dates where we learn new skills and share what we know with each other, and we’ve also worked out trades and barters for some skills – mending a friend’s pants once got me a couple jars of her delicious strawberry jam!! You might be surprised what some of your friends could teach you to do, or could barter with you for something you can do. Okay, this really should be the very first step! Because the first step is discerning how and where you need to make better use of your gifts, and that means prayerfully considering your lifestyle. Clearly, this is just a start. There are so many different personalities, needs and family situations that there’s no way I could address every need. There are so many websites and resources on how to save money, and make better use of what you have, that this post is really more an encouragement and a few ideas for you to consider your own situation. 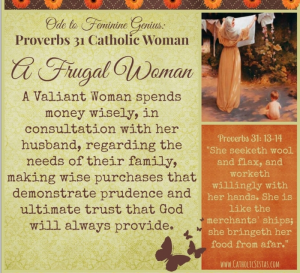 So put away the thought of a cranky, styleless, penny-pinching lady, and consider how you can joyfully be frugal with what you’ve been given. I’ll be there with you, singing while I mend my kiddos’ torn clothes! So, what are some tips that YOU can add to this list? In what ways do you live frugally and how does it help your family? Mary S. is happily married to a wonderful man and a mommy to two great rambunctious toddlers. She is blessed to stay home with her kids and also work from home doing sewing. As a cradle Catholic, she grew up in the Church and went to 12 years of Catholic school, but may have learned even more about her faith in the four years of liberal colleges surrounded by people who challenged her beliefs and sent her to research what she believed, and more importantly, WHY! She loves reading and learning about just about anything, but also loves just sitting back and tickling her kids until none of them can breathe! !